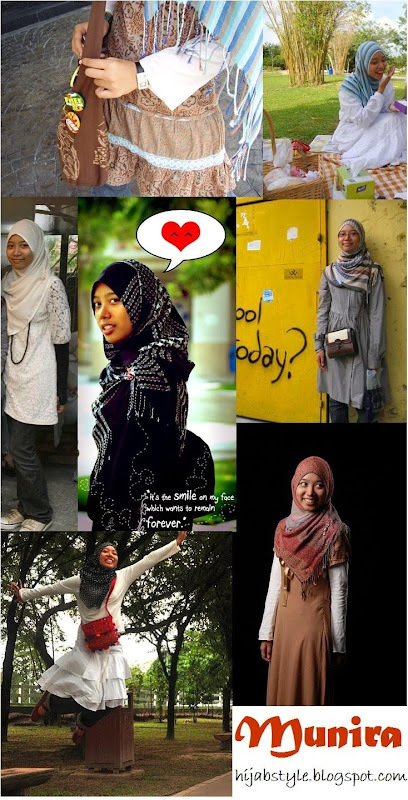 Salam, I'm Munira, and I'm a 20 year old student currently studying Architecture in Malaysia. I love all things creative, like art, poetry and photography. You can find some of my humble attempts at art here. My style is really a mix of things that inspire me, and that can come from history books, films, National Geographic magazines, art and random people. I also like to wear sneakers, even with skirts. I like to mix and match. Sometimes I'd wear a very grunge jacket with a long flowing skirt; I like the contrast. They actually complement each other well. I guess it suits my personality, I'm not exactly the most feminine girl, but I like wearing feminine skirts. Another thing about mixing and matching is, I prefer simple pieces. I don't really like pieces that have too many blings and trims. But those simple pieces I mix and match with other pieces and accessories, to create different looks according to my mood. I know you've heard it many times before, but just be comfortable and be yourself! Nothing can beat the beauty of someone being comfortable and confident in their own skin. Trends are exactly that: just trends, they come and go. But your personal style will go a long way. Another thing is to mix and match. One piece can go a long way. You can wear the same piece for several days in a row, but if you mix and match, people would hardly even notice that it's the same piece just worn differently! The next time you feel that itch to go shopping after seeing some spectacular outfits online or in magazines, look in your closet. There is bound to be some pieces you haven't worn for quite a while. Finding an old piece and giving it a new twist gives me a better feeling than buying a new one. And my one addiction is scarves. Because scarves are cheap and they can transform a whole outfit. A scarf is not just an accessory that completes an outfit, it is a crowning piece of clothing of its own that makes an outfit. Love ur style! Very pretty and bohemian! You have a simple but beautiful style. Love the style and looooove your art girl! MashAllah Munira! I love how great you look wearing simple clothes. My fav outfit of yours was the white one with the red bag- tres chic! ps- your soooo lucky that scarves are cheap! where i'm from, they are so expensive! Mashallah, what a beautiful sister with such cute style. Love it! I really love her style and it's fresh and vibrant!!!!!!!! !